Projects typically have multiple tasks that use different types of software applications, such as a word processor for writing and a spreadsheet for calculating. Working on these related tasks is simpler when the application windows are spread across different monitors. 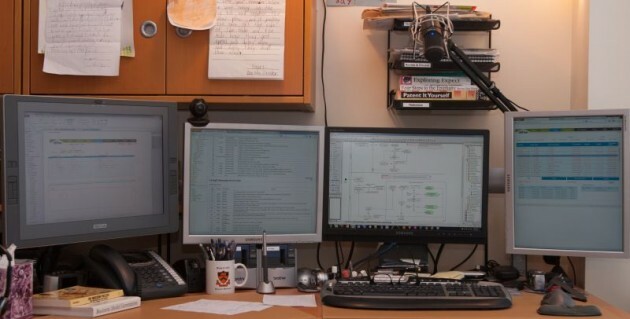 Navigating between these applications is fast and easy when they are spread across four separate monitors. Development speed is high because, par exemple, any change in the hand-sketched interface mockup can quickly be incorporated into the activity model and development story. I do not need to switch between or re-arrange windows to make such changes. Everything required for the project is always in front of me and always has my attention. Attempting to manage these tasks on fewer than four monitors is possible, but at a loss of efficiency. Switching between applications wastes time and saps energy because it requires searching for the right window. Applications hidden behind windows introduce errors or omissions in other tasks because an application that is out of my sight is also out of my mind. 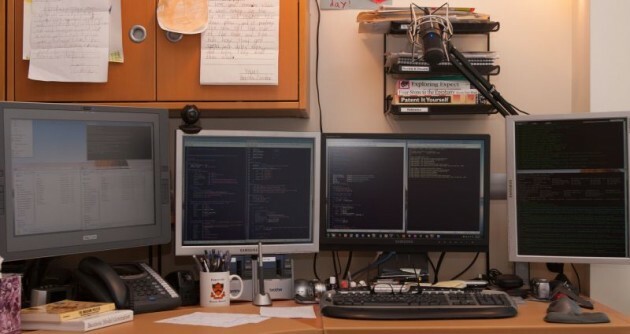 A higher level of productivity can be achieved by introducing multiple desktops, where each desktop is dedicated to a specific project or activity. This is the topic of my next article. © Jon Jaroker Tous droits réservés. Aucune image ne peut être copié ou utilisé sans l'autorisation écrite préalable du détenteur des droits. Déployé et maintenu par SOFIns.